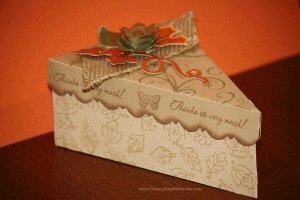 Making fun 3-D projects truly is a piece of cake with CTMH’s *NEW* Cricut Artiste cartridge! At last weekend’s Holiday Extravaganza, we had a whole cake made up of these darling & tasty (inside there were yummy homemade truffles!) cake slices. If you were lucky enough to attend and get a slice…congrats! If not, there’s no reason you can’t make yourself one! Within a matter of minutes, you could have your own by using the Cricut Artiste Collection found HERE. This entry was posted in CTMH Cricut Projects, Papercraft Ideas and tagged Close To My Heart stamps, Cricut Artiste, DIY Party Ideas, stampers. Bookmark the permalink.